A green leaf vegetable that can be used to make very nutritious chips. This page is about making lime kale chips. Quick and easy kale chips. A healthy alternative to potato chips. Cut or tear kale into 1 inch pieces. Place kale in a medium-large bowl. Toss kale in oil, lime juice (or vinegar), and salt. 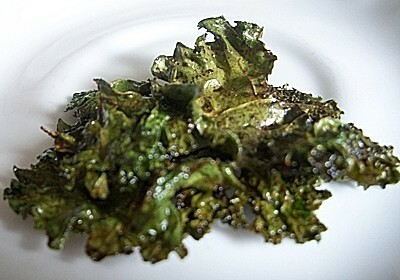 Place kale on baking sheet lined with wax paper. Bake at 350 degrees F for 5-7 minutes until kale is crispy. This sounds good, wish I would have planted some kale this year. I agree with the other posters about putting it on parchment paper or directly on the pan. I would think that the wax paper could catch fire also. Not being a cook, I have just one question. Why the use of waxed paper on something that is going in the oven? Won't the wax sort of 'melt off' and get on the chips? Why not just put them directly on the pan? I've made kale chips before but will have to try it with the lime. I agree with the other poster who questioned the wax paper. That is not for the oven. Parchment paper will work great. I made these over the weekend when I had company. They were a bit hit! so, thank you for posting. I wondered about the waxed paper too but used it on one pan and parchment on the other. Waxed paper worked fine but parchment paper did too. I would prefer to stick with the parchment.